Because this winter has been so much colder than the last, some of my evergreen perennials are doing wonderful things. I don't even mean that sarcastically. The cold turned my Mahonia nervosa wine-colored. The stems are pink! I recently read up on this plant and discovered that it doesn't want full sun, where I have mine sited. It's done fine so far (I barely watered it last summer) so I'm going to keep it there until it screams. 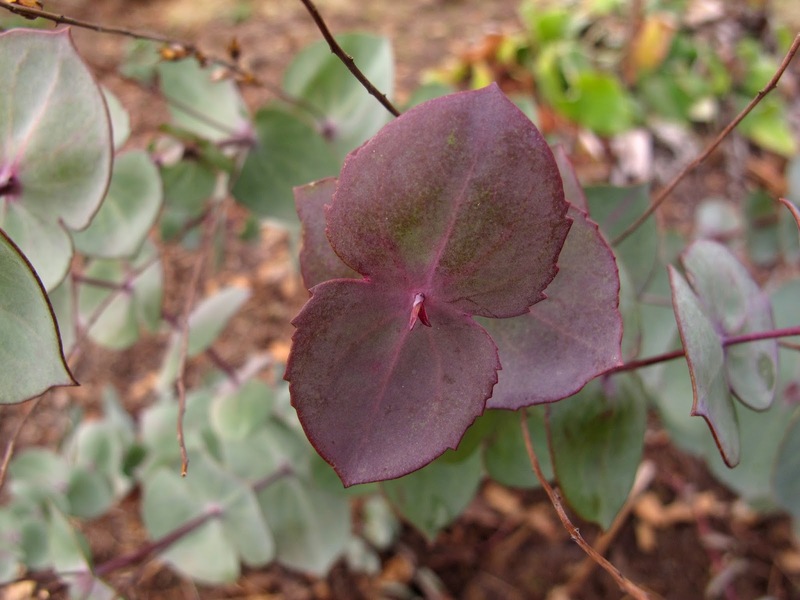 Parahebe perfoliata's purple stems have spilled their coloring into some of the leaves, making it even better looking than before. On the downside, my favorite agave is mush. Agave parryi, ay yi yi. This was before six inches of snow fell. It's completely rotted through and there's no saving it. Sigh. I guess I'll just have to go shopping at Cistus for a more cold-hardy replacement! Shopping at Cistus! Shopping at Cistus! Tomorrow? Interested ?? Oh that's such a bummer! I thought A. ovatifolia was hardier than that. Shoot, I can't. Next time? of COURSE! I'll let you know. Cold stress certainly does make some plants extra pretty, not so much for others. Shame about the agave but as you've said its a shopping opportunity!